HOW TO SELECT THE THEME. One of the most difficult part of writing a novel is how does one select a theme. Our conventional wisdom , which is based loosely on Freudian concepts , suggests that the the plot , the theme and the sensibility are not chosen consciously. It is the writer’s subconscious mind that selects and shapes these aspects of novel. Therefore , sometimes it is possible to analyze writer’s creativity by deconstructing her/ his novel. To the extent a writer is a product of the society and its culture , it is also possible to understand the society’s collective psyche by interpreting the social context of novels written during that period. However , these considerations are irrelevant as far as an individual writer is concerned. A writer is more concerned with her/ his aesthetics and sensibility. The creative processes which help an author in writing are anyway beyond her/ his control. Therefore , for a writer , what is critical is not the creative processes ( over which she/ he has no control ) but the aesthetics and sensibility of the final product ( over which she/ he has some control). In that sense , the notion of authorship is rather a nebulous concept because major part of writer’s output is not in her/ his control.A writer has only an ability to refine the creative output , but not an ability to alter the creative processes. Therefore any claim of being an author is only a nominal claim. These thoughts were predominant in my mind when I made a conscious choice of writing my second novel. Ironically enough, while content of a novel is not a matter of conscious choice for an author , whether to write a novel is partly a conscious choice. Of course , I have mentioned in my earlier blog about compulsive nature of creative writing, but I have realized that I am not a compulsive writer. I am a writer by choice. I think of writing as an act of self enlightenment. While writing my first novel , I have discovered several insights into my own life and by extrapolation into human existence. For me , therefore , writing a second novel was an act of further exploration. The key aspect of selecting a theme of novel is the tussle between the creative process on one side and a writer’s critical thinking on the other side. I too experienced the same. There were quite a few themes that my subconscious mind kept on throwing up. My critical thinking kept on rejecting them. After several weeks of publication of my first novel , I decided to write a novel about the theme of reincarnation. There are several reasons for this choice and I would elaborate on them in this and following blogs. In this blog , I would restrict myself to the reasons why my creative abilities and my critical thinking may have converged on this theme of reincarnation. I am saying ‘may have ‘ because I don’t think I can assert something about my creative abilities with any certainty. However , to the extent I can analyze , the following reasons seem possible. My creative instinct was attracted to this theme because of its metaphoric potential. Though being a scientist , my critical thinking was little skeptical about the validity of notion of reincarnation. Eventually , my creative instinct won and my critical thinking justified the choice by consoling itself , that may be this exercise of writing a novel on such a theme , would enable a scientist within me to debunk the very concept. Alternatively , I would get an opportunity to reflect on the logical consequences of such a possibility. I reminded myself that a true characteristic of an educated mind is its ability to examine a postulate without believing it. I thought to myself that this could be an opportunity to understand the popularity of this theme in spite of lack of any evidence. There must be some reason why this theme is so popular. I was hoping to deconstruct this irrational belief and it’s hold on our collective imagination. However , after writing the first chapter , I realized that things are more complicated than what I had thought earlier. It is not a simple case of an objective mind dispassionately dissecting a web of irrational beliefs. To my surprise , a part of myself wants to believe in this notion of reincarnation. I wish to understand why a scientist ought to be riddled with such an ambivalent attitude. To that extent , this novel would be about self exploration. Why should I , with my scientific training , be ambivalent about this irrational belief ? Is there really something beyond science ? I am planning to explore those options in my novel. There are several aspects to writing such a novel. I can mention some of them upfront. Apart from its metaphoric potential , I think the novel can offer a rich diversity of characters , their social backgrounds and their personalities. As a writer this is a rewarding experience. The novel on reincarnation offers kaleidoscopic collage for a writer to accommodate diverse personalities , diverse attitudes and diverse values into a single narrative. I am looking forward to writing this novel. In the following blogs I would select some of these aspects and elaborate on them and try to describe my own experience in handling them. MY SECOND NOVEL. BLOG #1. ON STARTING A NEW BOOK. It is now couple of months since my first novel was published. The realization of this fact is just sinking in. In last few weeks , I have experienced the whole gamut of emotions. From ecstasy to apprehension , from contentment to catharsis and from wish fulfillment to vacuity , I have experienced all these emotions. Till I published my novel , I was emotionally attached to this novel. It was part and parcel of my own identity. Now , after having published the novel , I have realized that the novel has its own independent existence. Like the characters in the book , the novel itself has taken over its course of destiny. It is a bittersweet separation. Once I realized that this novel and I , myself , have separated forever , I felt a vacuum inside. William Shakespeare has observed somewhere that Nature abhors vacuum. I am not sure about Nature , but I am sure human mind does abhor vacuum. At least my mind does. So , without my knowledge and without my consent , my subconscious mind has started weaving another story. In fact , forced by such inner compulsions , I have written a preface of my next novel on 21st February 2016. However , before going into the details of this still unwritten book , i would like to discuss about my own inner compulsions which force me to venture into writing a novel once again . The question that bothers me is that is creative writing some kind of compulsion ? Or more to put it more strongly , is the creative writing some kind of addiction ? I can think of at least two literary giants Rilke and Beckett who have admitted to such fundamentally irresistible compulsion to write. Rilke , for instance , was once asked by a young poet about process of writing. He suggested that one should write poems only when one feels that one can not live without writing poems. To Rilke , writing was not an optional activity. To him , it was synonymous with living. Similarly Becket has admitted that a true writer is the one who knows that she/ he has no caliber to write , no skills in writing and still she/he knows in her/his heart that she/ he is condemned to write. Here also , there is an admission of certain compulsion , certain inevitability about need to write. Thus , when I began my second novel , I was apprehensive about my own mental frame. Was I too governed by such compulsions ? On little reflection , I realized that my compulsions are of different types. I think I write because writing ,to me , is an act of self exploration. It , in some sense , ennobles and enlightens me. Therefore ,writing , for me , is an act of volition. I aspire to be a better human being and therefore I write. Admittedly , there is a compulsion , but it is a compulsion comparable to that of an explorer bitten by wanderlust. I also realized that this urge to write could also be self referential. Is it that my writings are full of myself ? The answer to this question is a partial yes. I think my writing began on a self referential note. However , as I enter into my second novel , I can confess that my writing is getting more and more focused on human angst. I am more concerned about relevance of human life in the background of our universe. The Nature , it appears sometimes , is indifferent to human existence and human values. I remember Camus has rightly said that mankind just needs to answer only one question. Whether a life is worth living or not ? I also agree that unless one discovers why we struggle to pursue our human values in an otherwise amoral universe , everything else is trivial. The question is whether a writer , that too a novelist , is equipped to answer this question or not ? It is my belief that she/he is. For me , writing is raison d’être. In my first novel , I had tried to unravel inner contradictions in a person’s mind. I had attempted to show that in trying to achieve internal consistency, an individual would end up creating delusions. Our emotional drives are so powerful that they distort our perception of reality. What bothered me at that time was the fact that two faculties of human beings , our ability to experience the emotions and our ability to use reason for understanding reality , were working at cross purposes. There is no explanation for the coexistence of this mutually incompatible abilities in each of us. In my opinion , human being is fragmented into several dimensions. The only way for any individual to make sense of her/ his existence is to distort either one’s emotions or to distort the reality. This is precisely what happened to Manas. He chose to distort the reality so that his emotional health remains good. However , after finishing the novel , I realized that that the pathos of his life is only at a personal level. As a writer , now I want to look at inner contradictions that manifest at a collective level. Every individual imports or imbibes the values prevalent in the society. If any individual is fragmented , , the roots of this fragmentation must lie in our society at large. Every society , every civilization is beset with inherent contradictions. These contradictions are transmitted to the individuals who live in that society. However , for any writer , it is important to have two qualities before she/he ventures into commenting about these cultural contradictions. Firstly she/ he must be non judgemental and secondly she/he must be full of empathy. My second novel would try to be both , non judgmental and empathetic. It is my belief that our culture has enormous depth and it is necessary to respect that depth. Therefore , I have decided to select a set of beliefs that are very widely held and still they are irrational. This refers to our beliefs in reincarnation. My novel would try to observe the conflicting tendencies of an individual when he is faced with his own irrational belief in reincarnation. One part of his mind is convinced that he is witnessing an instance of reincarnation, while another part of his mind tells him that it is his emotional inadequacies that forces him to believe in reincarnation. The novel unfolds the inner contradictions between his rationalism and his own growing conviction that there is indeed something like reincarnation. In the process , the protagonist discovers his own self. Here neither belief nor his scepticism wins in the end ,however he realizes that he is sum total of many parts and all of them do not add up. 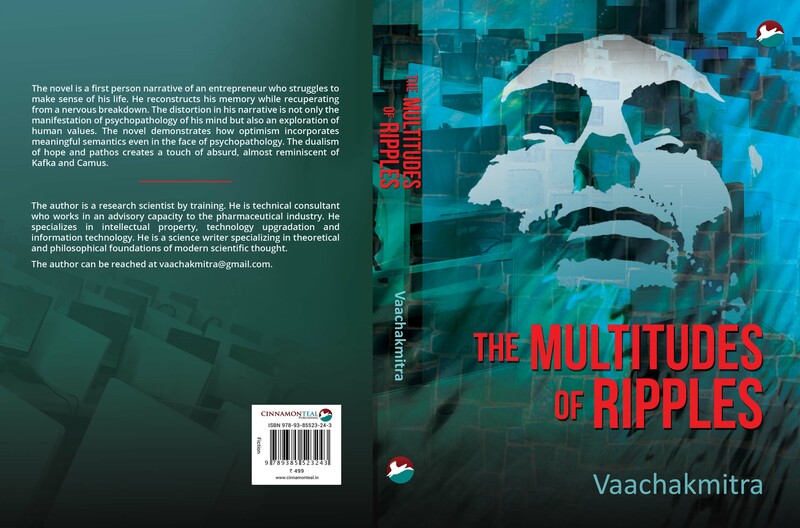 THE MULTITUDES OF RIPPLES. BLOG 8. THE ROLE OF A NARRATOR IN NOVEL. The essence of writing a novel is creating a narrative. There are two aspects of narrative. Firstly , the narrative is unfolding of events during the passage of time. In case of avant garde fiction like stream of consciousness it is the unfolding of thoughts. In case of surreal fiction this unfolding is not in the linear fashion. The narrative , in this case , does not follow the normal direction from past to present and from present to future but there is a flow of time and there is corresponding unfolding of events. In that sense , unfolding is the essence of fiction , though the nature of unfolding and content of unfolding changes according to writer’s own predilections. The second key aspect of a narrative is the presence of narrator. In this blog , I would describe my own views and my own experience in creating a narrator in my novel. I think a narrator personifies a particular viewpoint. She/ he represents whole lot of value judgements , social norms and psychological framework. On little reflection , one realizes gthat after all this is what a person is. In hindsight , this personification of narrative requirements looks obvious but I did not realize while beginning this novel. Once one accepts that a narrative needs a personified frame of reference for the narrative , the question arises whom does the narrator represents. Sometimes the narrator represents the author. Sometimes the narrator represents the the collective sensibilities of the society in which the narrative unfolds. When I began writing this novel , I wanted a first person narrative because , as a beginner , I found it easier to internalize Manas’s own emotions. As mentioned in my earlier blogs , I was trying to unravel my emotions through writing a novel. Therefore this process of internalization of Manas’s emotions was effortless. Maybe this is the reason why some authors create a narrator so that process of transference between an author and a narrator facilitate the creative process. There was another reason for me to create first person narrative. I had always believed that a good literature is always multilayered. Therefore , rather naively , I wanted to create multilayered personality of Manas .I thought at that time that it would be a good idea to have Manas observing himself and commenting on his own persona. This strategy largely worked. However , a strange thing started happening as the narrative progressed. As Manas became uncomfortable with his past , his narrative started getting distorted. The whole psychopathology of Manas started surfacing. Initially , I had thought of using alternate dimensions as a metaphor for our subconscious mind. However , as the narrative progressed , it started representing a device of accommodating Manas’s fragmented personality. Of course there is an overlap between my original intention and the final outcome. The fragmentation of individual entity into different characters was not planned. It was as if , Manas had taken over the role of a narrator and had started dictating the narrative. Though this interplay between an author and his/ her characters is , by itself , subject matter of good fiction , I was not ready for it. Therefore who was the narrator in this novel is not very well demarcated. I began this novel with the intention of using a narrator as a literary device for creating a depth. However , the device became autonomous entity beyond my control. I have pondered over this and have come to conclusion that the two explanations for this. One possibility is that I and Manas are , somewhere deep within , psychological twins. Therefore Manas had no difficulty in wresting control of the narrator. Alternatively , it is possible that I , as a creator of Manas , was more of a doting parent who willy nilly surrendered his authority to his child. After all I named him as my son Manasputra. In either case , it is a troubling reality. This is last of my blogs on this novel. I hope the readers have sufficient insights into the processes that went into creating this novel. This book is available at following linkages.